Australian horses tend to enjoy more liberty and social contact than their European peers, research suggests, although about a quarter appear to live alone. Researchers have delved into horse-keeping practices in Australia, based on the findings of a 37-question online survey backed by the Australian Horse Industry Council. The survey aimed to gain an understanding of general horse-keeping practices, including shelter, social contact, exercise, watering and supplementary feeding. In all, they received responses from 505 owners, each of whom gave answers in relation to one representative horse in their care. The sample represented 0.13% of the estimated 400,000 horse owners across Australia. Most horses represented in the survey were kept in states along Australia’s east coast. 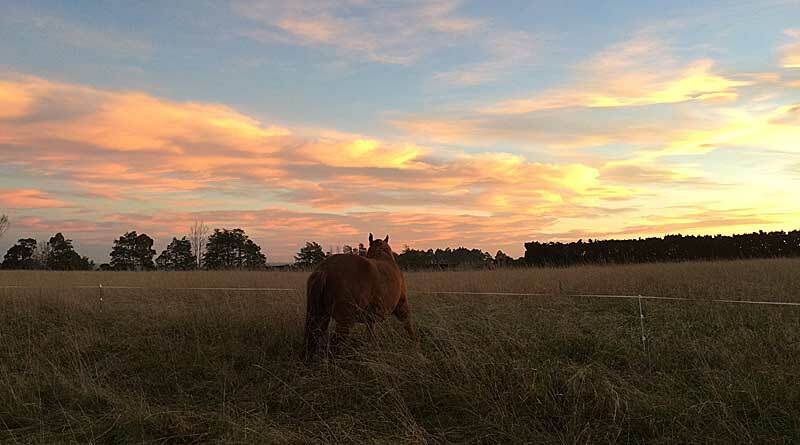 Kirrilly Thompson and her colleagues found that 83% of the horses were managed at pasture, with around a quarter of them kept alone (26%) or with one companion animal (27%). A further 6% of horses were kept in a large yard, while only 10 participants (2%) kept their horses permanently in stables. Around 82% of horse owners supplied hay to their horses, most commonly in combination with grazing. The researchers, reporting in the Australian Veterinary Journal, cited two key areas of potential concern around welfare − one-quarter of the stabled horses were prevented from having free social and physical contact with other horses, and one-fifth of stabled horses were being exercised less than daily. A small number of participants also cited a stable size below commonly accepted recommendations. If horses were confined to a stable or small yard, the most recorded means of exercise was riding, at 65%. The average age of the horses represented in the survey was 10 years, ranging from 1 to over 40. Ten percent of the horses were found to be older than 20. Thoroughbreds accounted for 24% of the horses. Four breeds accounted for 55% of the horses: Thoroughbred, Australian Stock Horse, Quarter Horse and Warmblood. Almost three-quarters of owners or carers kept their horses in the same accommodation type irrespective of day or night, or weather. Participants who stabled their horses were more likely to do so during the night and even more so during a cold night. All participants provided some form of shelter, with 62% indicating that there was natural shelter within the paddock, while 30% had a man-made shelter within the paddocks and 8% used rugs rather than shelter. Sixty percent of those whose horses were restricted to stables or yards said they exercised them once a day and 21% exercised their horse more than twice a day. A total of 18% – that’s 13 of the 72 horses kept under such conditions – exercised their horses less than once per day, with two of the 72 were exercised only once weekly. Discussing their findings, Thompson and her colleagues said: “Horses are social, herd animals, yet one-quarter of participants reported their survey horses did not have an equine companion when paddocked. “However, it was often unclear in the present survey whether the horse in question was able to see or have contact with other horses. By comparison, the study team noted that three-quarters of European horses were reportedly housed singly. Confinement and restricted movement have been associated with poor equine welfare, they said. “Our survey found that 25% of the survey horses that were ‘confined’ were exercised less than once per day, which is inadequate according to Australian Horse Welfare Protocol guidelines. The researchers said the horsekeeping profile identified in their study should inform the content of informational and educational horse-keeping interventions and be considered by veterinarians when pre-empting, treating or rehabilitating sick or injured horses in Australia. Associate Professor Thompson is principal researcher and a culutral anthropologist with Central Queensland University’s Appleton Institute, a multidisciplinary research hub in Adelaide which forms part of the School of Human, Health and Social Science. KR Thompson, L Clarkson, CB Riley and M van den Berg.